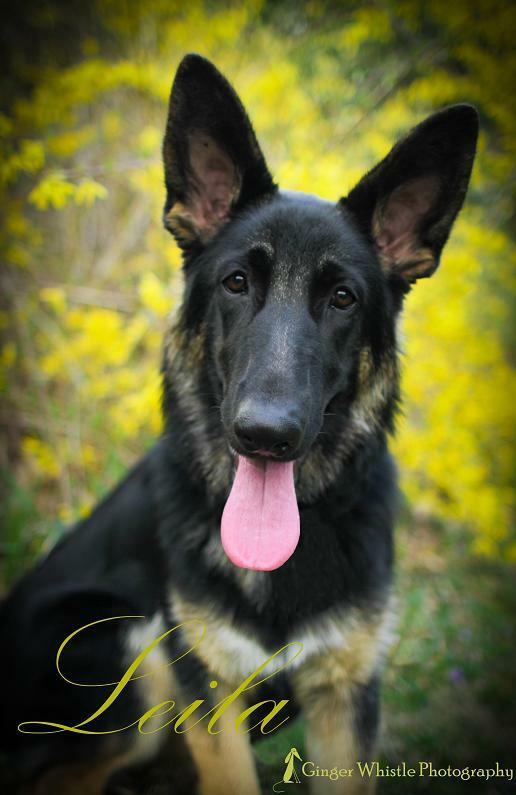 Leila celebrated her third birthday just about a week after delivering her first litter of pups in 2013. At left is a headshot of her at five months old. This will be Leila’s second litter. She lives in Mansfield Township, NJ with her human mom and dad, German Shepherd daddy, Marcus, five cats, and her best friend, Iggy, a 6-lb toy poodle (no kidding). Leila was Jane’s pick of four near-simultaneous litters, showing exceptional potential for show and breeding from the very start. She was a beautiful mover as soon as she started to get around, and literally never went through the typical puppy “awkward” stage. She is more than a beauty, though. She is highly intelligent, very tuned into her family and was a pleasure to train. Below is a video of Leila less than a month after we got her, which shows how quickly she learns. In the video, she is not yet four months old! Oh, and that’s not a road on which I am walking the puppy off lead, it’s our driveway. Speaking of which – all of our dogs are walked off lead, exclusively, on our property. We have 60 acres, surrounded by several hundred acres of State land. So we walk the driveway (3/4 of a mile long) at least twice a day, usually three times. But of course the dogs don’t just walk, they run, chasing frisbees, sticks and each other, putting in about double the miles we humans do. Which means that Leila is in fantastic shape, and super healthy to carry and deliver puppies. The puppies are not being raised in any type of kennel facility or outbuilding. They are in our home, in our sunroom right off the living room to be exact! They are becoming familiar with the typical sounds, sights and smells of a family environment. Visitors, other pets, comings and goings of people, the sounds of music and television… all this helps to give them a well-rounded puppyhood, and a solid foundation for a calm, well-adjusted adulthood. Born 1/20/2010 to AKC “Kabre-Kaleef’s CK Von Hornberger” DN16078703 and AKC Champion “Jantar’s Hummer of Stonewall Witmer” DN12045604. 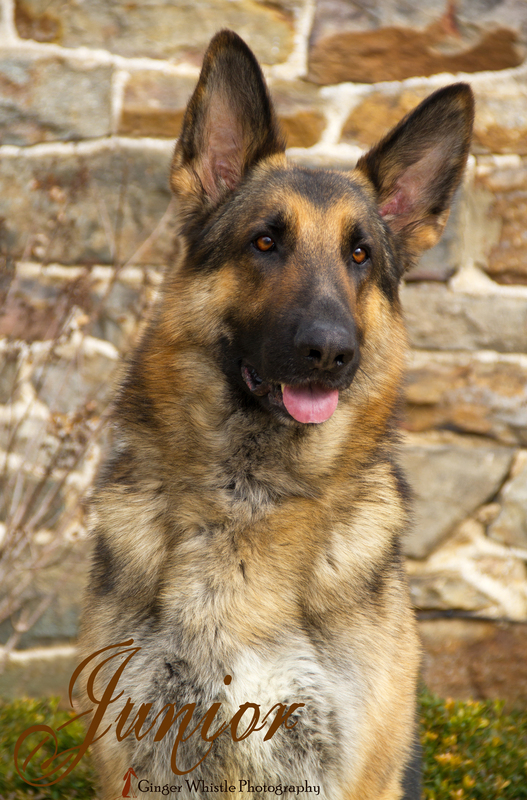 Junior is a gorgeous three year old Sable boy. He spent his early life in Virginia and touring the country, wowing judges on the show circuit. 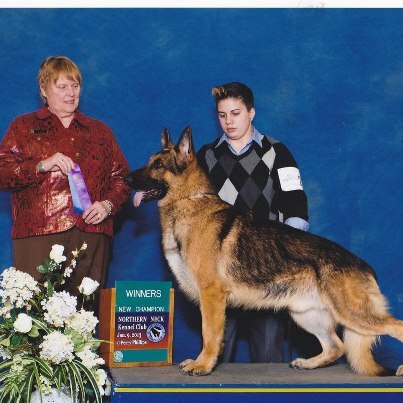 He finished his AKC Championship earlier this year. He now lives at home with Jane and Anthony at Janry Pet Resort in Stewartsville, NJ. Junior is a sweetheart and is so loyal to the people he loves. Jane says that if he could, he would be glued to her and never part! He is happiest when he is being touched and rubbed. He would sleep in bed all night if you would let him. He is as gentle as a lamb taking food and light as a feather on a lead. Leila and Junior were chosen as parents based on their sound health, exceptional, stable temperaments, loving personalities, and their wonderful physical attributes. The puppies will make perfect family dogs and may excel in the show ring. Both parents are AKC registered, and so the puppies will also be able to be AKC registered should their future parents so desire. Leila and Junior were bred during the third week of April, and their puppies are expected June 20-25. We never let our puppies leave their mom before eight weeks of age. Depending on the puppy and his or her development, we may even request to keep him or her a bit longer. Being with mom and siblings is extremely important for a puppy’s socialization. The puppies will be raised in a home with three adult dogs: Leila, of course; Marcus, Leila’s GSD father, and Iggy, a tiny toy poodle. We also have 5 cats, three of whom absolutely love dogs. So the puppies will be socialized to dogs both big and small, and cats. This is of course very beneficial for their future lives. All of our animals get along famously. It is not a rare occurrence to find a fluffy orange tabby curled up in the arms of one of the Shepherds. Several of our friends’ children also come and visit and play with the puppies on a regular basis. As we don’t have children ourselves, we are so pleased to have them come and get to know what “baby dogs” are like — and have the puppies socialized to children of all ages. Dr. Mary Stankovics at Pleasant Valley Vets in Washington, NJ is fully equipped and experienced to see a female though the breeding, pregnancy and whelping process. We highly recommend Dr. Mary to all breeders. Hackettstown Animal Hospital has also been taking care of our cats and dogs for many years. A huge thank-you to Dr. Alex Cochogar there for making himself available and his willingness to do an emergency c-section on Leila for her first litter.